Children like to interact and do things rather than just look. 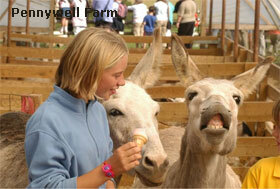 Give children the opportunity to play, to experience something new during your holiday in Devon. Begin by booking a cottage holiday. This ensures somewhere clean, warm and comfortable as a base that you can enjoy returning to. With young children it may be helpful to rent a Devon cottage with an enclosed garden where children can play safely. Something that parents really like is a single entrance fee and then let the children choose the activities they want without much or any additional cost. Not only is there are wide variety of animals to pet and enjoy such as ponies, goats and guinea pigs, reindeer and rides, hedgehogs, bunnies, piglets, eagles and owls to watch but also play equipment to use such as slides, go-karts, quad bikes, train rides, walks and mazes, trampolines and tractors, ice creams and a licensed restaurant. Thee is a daily calendar of fun activities every 30 minutes - come and join in, watch, learn and have fun, almost everything is included in the entry price and all the day's activities are on a notice board as you walk in. Great fun for all the family. Click on the photograph above to find out more. 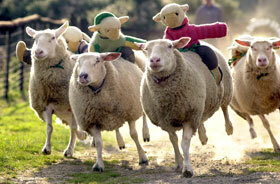 “Awesome” – “Cool” – “Brilliant” - Kids verdict on BIG Sheep – The Best day of your holiday… baa none! Hilarious live shows including sheep racing, bottle feeding our baby lambs, dog and duck trials and shearing demonstrations. Other attraction include a HUGE indoor Ewetopia playground for all ages, Eweston station train ride, Battlefield Live outdoor laser games, pony rides, safari tractor ride, and onsite real ale brewery with free samples for over 18’s. Click on the photo for details of this day out for the family that you can enjoy when the sun shines and still have plenty to do if there's a shower.